The other half of this NFC East rivalry weekend will take place in Landover, MD, with this season’s second installment of Cowboys vs. Redskins. These teams met back in Week 3, and Dallas fought through a Tony Romo injury and a number of mistakes to defeat Washington with six Dan Bailey field goals. The Dallas Cowboys lost the momentum from this game, however, losing three of their next four during the continued absence of star receiver Miles Austin. “America’s Team” has reversed its fortunes in the last two week, though, with convincing victories over the Seattle Seahawks and former Super Bowl foe Buffalo Bills. Currently looming just a game behind division-leading New York, Dallas needs to continue to pressure the Giants by winning and give themselves a chance to win the division when they play New York twice in the last four weeks of the season. The Cowboys will arrive at FedEx Field this weekend to find an opponent with little identity and even less hope for this season. Aside from the Week 3 loss, the Washington Redskins started the 2011 campaign 3-1 and entered their bye week with the division lead. The second quarter of the season, however, has not held the same success rate. While rookie Roy Helu and a respectable defense have offered some hope, heralded coach Mike Shanahan has lost much of the fan support he garnered when he first landed with the team a year ago. Offensive weapons Tim Hightower and Santana Moss were injured and the quarterback position has developed into a strange carousel between the equally unsuccessful John Beck and Rex Grossman. The Redskins have now lost five straight and are tied with underachieving Philadelphia in the division’s basement. Regardless of the home team’s recent woes, though, the demand for tickets to an always-heated Cowboys vs Redskins game continues to be high. The average price of a seat is currently just below $200, ranking it fifth in the list of the most expensive NFL Week 12 tickets. The Redskins faithful continue to cheer the tradition and culture their team has developed, especially when their biggest rival is in town, no matter how grim the season-long outlook may be. And Cowboys fans continue to be one of the most populous and well-traveled group of supporters in the game, willing to follow their team and pay good money to watch it live. Will two quarterbacks with reputations for letting it fly produce a high-scoring affair in the nation’s capital, or will those aggressive choices lead to turnovers that make this game more of a comedy and an old-fashioned Western shootout? 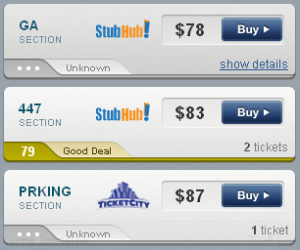 No matter which team you’re cheering for, you can use SeatGeek’s ability to search all of the best ticket listings at once and pick out the best deals available. Start your search for Dallas Cowboys at Washington Redskins ticket deals with these highlights and buy yourself a seat for the action. The Best Deal can be found in LOGE section 389 for $199, which puts you in the lower part of the upper bowl in a corner of the End Zone. 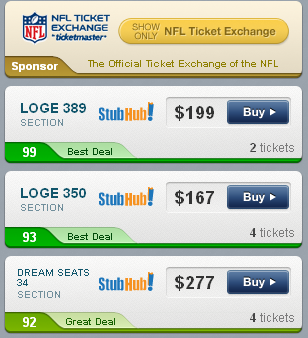 The second best Deal Score is located in another LOGE section, this time 350, for $167. 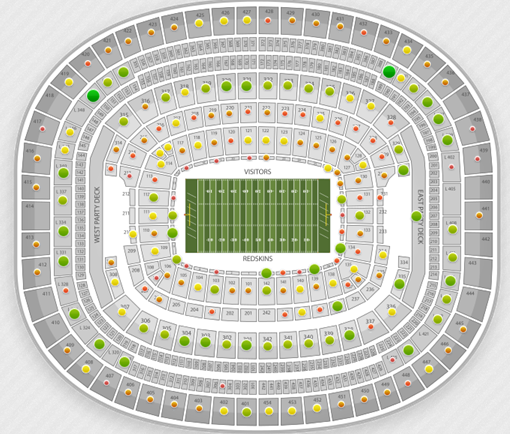 Located in another End Zone corner, you’d be getting a great view for about 16% below the average ticket. Just looking to get in the door? 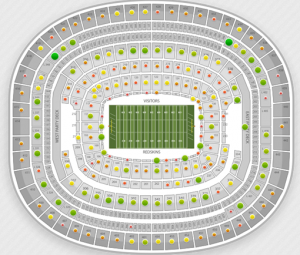 The cheapest Cowboys-Redskins ticket is a General Admission one starting at $78; for another $5 ($83), you can actually get a seat for yourself in row 19 of the upper deck’s section 447. That’s still cheaper than some parking options! When it comes to rivalry games, especially in huge venues like FedEx Field, is always fun to see where the biggest spenders are landing. And, wow, there is one big fish waiting in section 102 (on the home sideline’s 30 yard line). Four tickets are available in that listing for $21,309 each! Now that, good reader, is a devoted (and quite wealthy) fan who buys those seats. If you have any questions about Cowboys at Redskins tickets, feel free to contact us on twitter @SeatGeek or write chad@seatgeek.com. Enjoy the game!